UK Sport has spent £182,000 on five campaigns for senior positions in global sport in the last two years. The agency, which funds Olympic and Paralympic sport, backed campaigns by Lord Coe, Brian Cookson, Sir Phillip Craven, John McEwen and Louise Martin. Two thirds of that sum, £115,000, went to one company, Vero Communications. "If we care about the future of international sport then we've got to get off the bench and into the game," said UK Sport's Simon Morton. "That means supporting British administrators to secure international leadership positions to ensure that the UK, as one of the world's leading sporting nations, has a strong voice in developing world sport. "We are proud of our record, as we believe it is essential to ensure that our national governing bodies can engage effectively with the international community and contribute to the governance, development and leadership of world sport." But some within British Olympic and Paralympic sport have questioned the wisdom of spending money that could be targeted at young athletes on the business of sports politics. 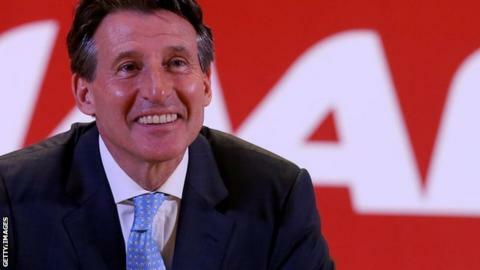 "Seb Coe being president of world athletics does not win us any medals," said Jessica Ennis-Hill's coach Toni Minichiello. "He has said that two thirds of his campaign budget came from private sources. Did he even need the public money? Could it have been a loan instead? "That money could have been shared with 63 young athletes. They could have paid for their medical insurance for a year and bus fares to training." Of those five campaigns, only McEwen's run for the presidency of the International Equestrian Federation was unsuccessful. UK Sport gave Vero, which is run by sports lobbyist Mike Lee, £10,000 for that bid. The UK-based "strategic communications company", which helped secure the 2016 Summer Games for Rio and 2022 World Cup for Qatar, was also given £63,000 for work on Coe's hard-fought campaign to become global athletics chief. Coe and Lee also worked together on London's successful bid for the 2012 Olympics. UK Sport contributed £77,000 to Cookson's bitter 2013 battle for the presidency of the International Cycling Union, with Vero receiving £24,000. British Cycling contributed another £43,000 from its "international influence" budget, with most of the money spent on travel, preparing Cookson's manifesto and professional advice on how to restructure the federation. It is unclear if Vero went through any official tendering process but UK Sport told BBC Sport it had "secured a preferential rate" with Lee's firm. UK Sport, which got a 29% annual increase in the amount of tax-payers' money it receives in Tuesday's comprehensive spending review, has made no secret of its international relations strategy. The contribution from the public purse accounts for a third of its current £135m annual budget, with the rest coming from the National Lottery. Its three international goals - global influence, developing British administrators and maximising the legacy from major events - are listed on the agency's website, and leading ex-athletes such as Kelly Sotherton have been through its "international leadership programme", which is now in its eighth year. All of this, however, is secondary to its main stated purpose of maximising Britain's chances of winning medals on the world stage. "It's important that the governance of world governing bodies is exemplary, and we've all seen examples recently where that hasn't been the case," said UK Sport chairman Rod Carr. "Now, we're not arrogant enough to think that only Brits can put that right but we think there is a cadre of talented and honest people here that can really help those international federations that have failed that test. "But the reality is that costs money. It would be naive to send somebody into that competition with no funds to go fly and talk to people and garner support from other parts of the world. "It's a great investment. If we have sports like athletics and cycling, which have both had their moments, better managed and governed, that is good for the sport worldwide and good for us."